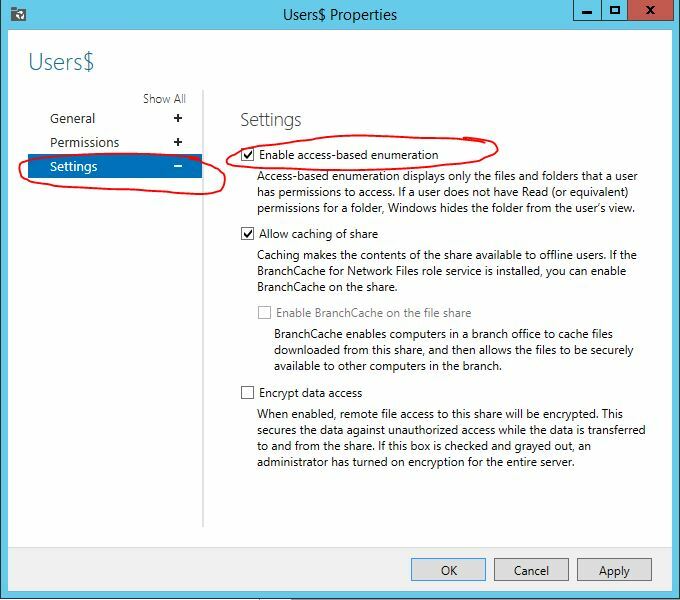 You have setup a brand new Windows Server 2012 R2 Server and want to share a User folder in the network that will be entered into AD into every user. As we keep a high standard of user integrity we will want to take every necessary precaution to prevent users from accessing/viewing/deleting each others files. This walk through takes for granted that this server is a part of an active directory environment. Right-click on this folder and select Properties. 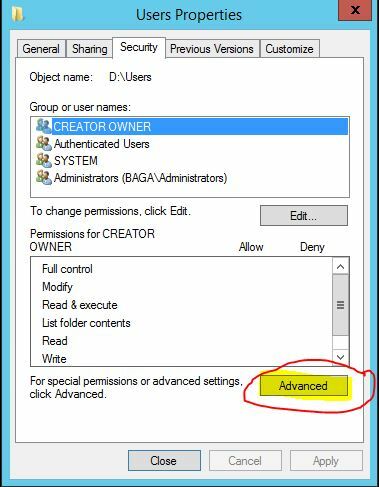 Click Add, and add the following groups: Administrators, System, Authenticated Users. 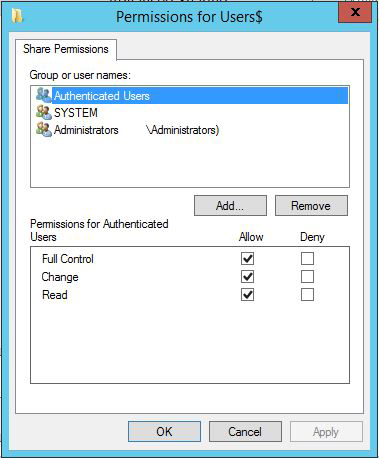 For each group (there should be three) give them full permissions (select allow under full control). 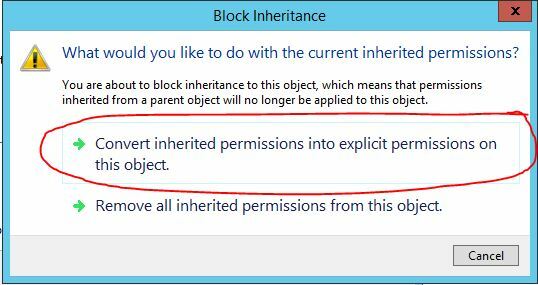 Click on “Convert inherited permissions into explicit permissions on this object” when the warning prompt pops up. 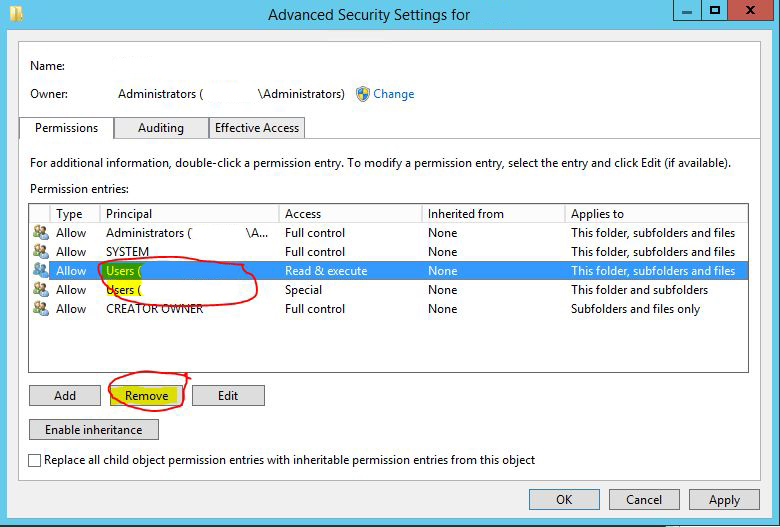 Select Add and under Principal click “Select a principal” and in the search box type authenticated users and hit enter. At Applies To: Select: This folder only. 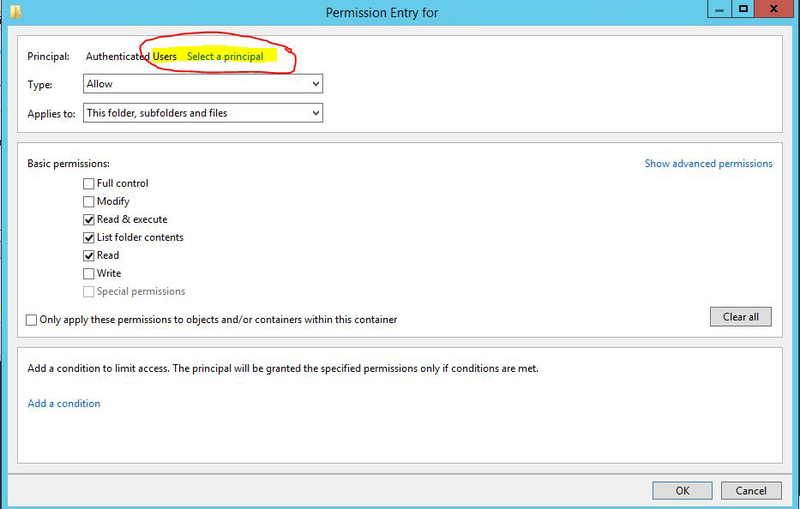 For the permissions select allow for: Traverse folder / execute file, List folder/read data, Read attributes, Read extended attributes, Read permissions. Now your Security tab should look like the image below. 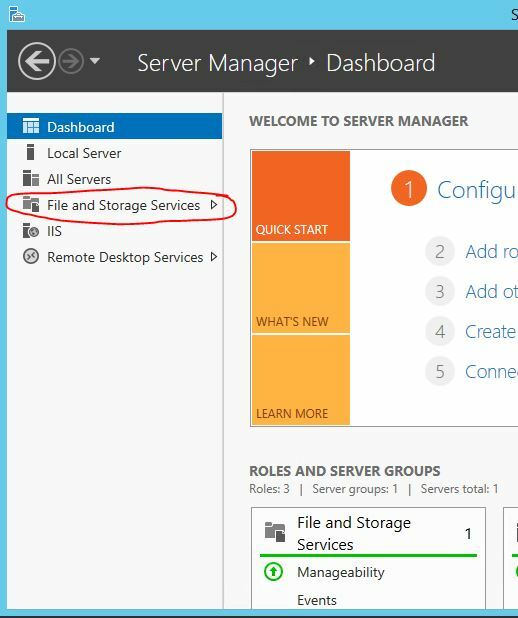 Go to Start > Server Manager and click on File and Storage Services in the left menu. Click on Shares and select the Users$ share you just created. 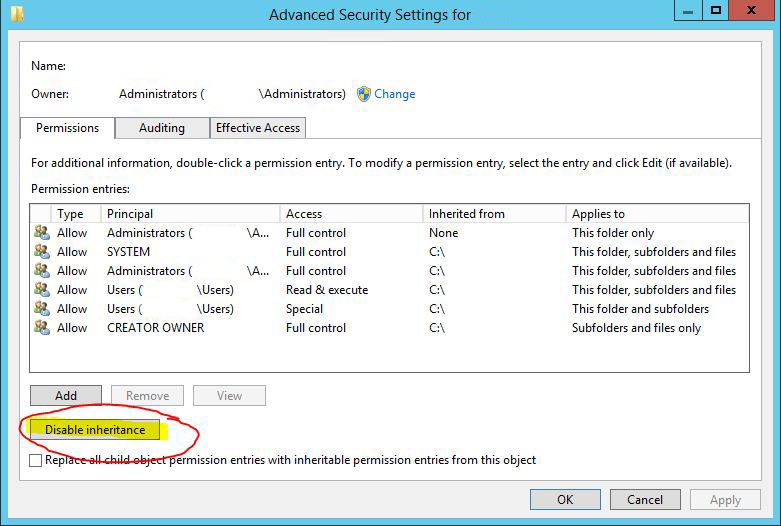 Click on Settings + and Select Enable access-based enumeration such as the picture below. Close out the Server Manager window. Navigate to the User you want to add the User folder to. Right click and select properties on the user. Under the section Home folder: Select the Connect radio button. 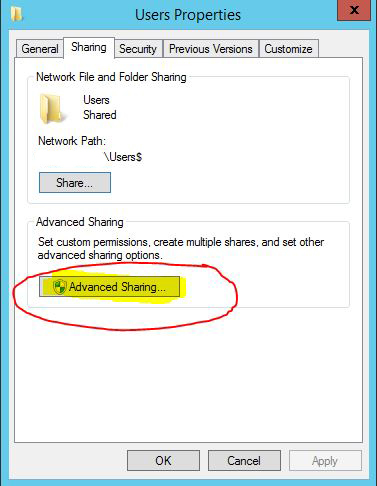 If you now browse to the Users$ share folder on the server you created it on. 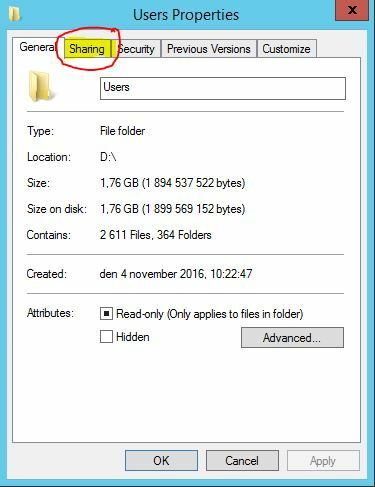 You will notice a folder in it with the users username as the folder name. 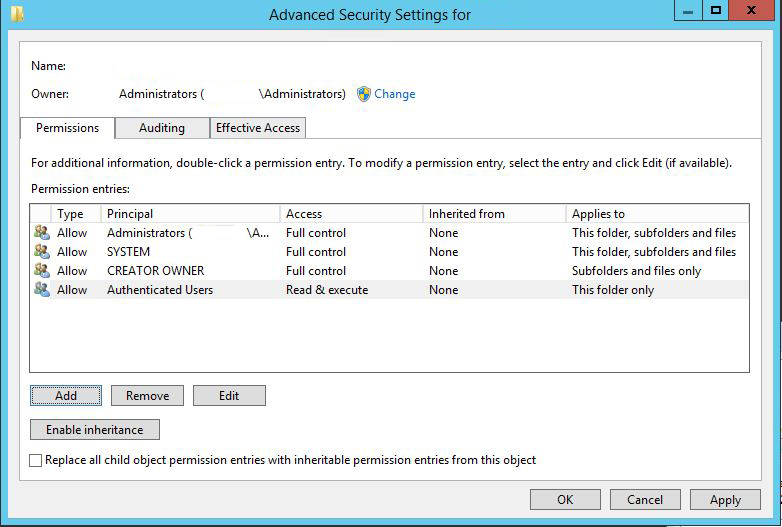 If you check the permissions for the folder the right permissions have automatically been applied. This technique will definitely save you lots of time as if you were doing it via old net use scripts. Congratulations you have successfully added a user folder share and added it to a user. 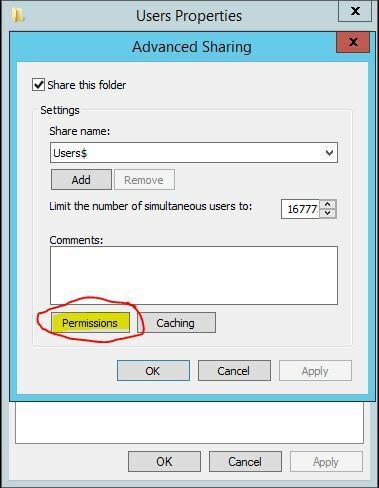 Please note that this can be done to multiple users at once, all you do is select all the users in active directory and add the user share to the users. Feel free to post comments if things are unclear or so, it’s very easy to miss certain details when making a guide like this.